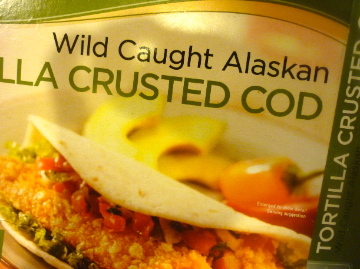 They sell wild caught Alaskan Cod fillets encrusted in tortilla crumbs. You bake them in the oven. The crust on the fish has a little zing to it. They come out of the oven crunchy and ready to go. A lady was placing them in a flour tortilla, then topping with Mango Salsa found in the specialty cheese section, near the meat. I bought both items, immediately. I doctored up my store bought salsa a bit by adding a squeeze of lime, a handful of chopped cilantro and a pinch of cumin. When I made them for dinner the first night, I didn't have anything else in the fridge but some baby spinach. It was fine in a pinch. 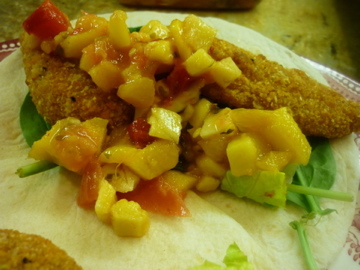 The next time I served these fish tacos, I made slaw. I bought broccoli slaw instead of cabbage, just to keep the dish healthy as possible. I took light ranch dressing, which I abhor on its own, poured it into the food processor and added some smoky, chipotle chilies to it. 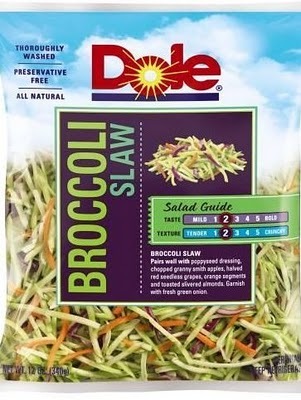 Thin it with a little lime and you have a great slaw dressing! I hate to tell you this, but you can buy southwestern or spicy ranch if you're in a hurry and just toss as is with the broccoli slaw. 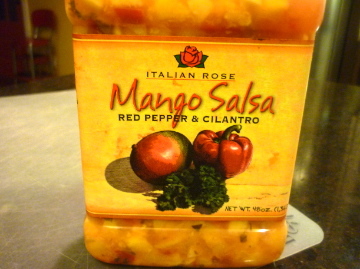 Combine the chipotle, ranch and honey in a blender or food processor. Puree until smooth. Add lime juice and mix thoroughly. Toss with broccoli slaw and adjust seasonings to taste. Add a pinch of salt and lots of black pepper. Allow to sit for about 1/2 hour before serving. Pile the broccoli slaw in a warm tortilla. 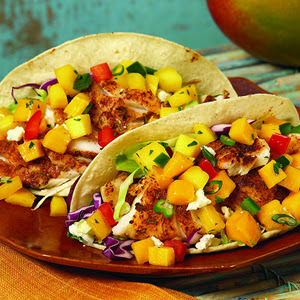 Top with fish and mango salsa.